I decided to tackle the outside of my front door before 120 degrees crept up on me and I was forced to paint in a bikini. Isn't this entryway the prime candidate for a make-over? YES! I talked my cute little brother, Jeff, into coming over to help a sister out. He was more than happy when I told him there would be lunch and dessert included. I had bought this foam type crown molding on clearance at Lowe's a couple months ago for $13 and knew it would be the perfect thing atop my sad and understated front door. Remember, I am in a rental, so I don't want to go too crazy spending my (husband's) hard earned cash. I knew with the addition of the crown and some paint, I could turn it into something that didn't make my stomach churn each time I pulled into the driveway. I'm always amazed at the power of a little bit of paint.... what an amazing change it can make! I used a Benjamin Moore color called Iron Mountain. I bought a quart of it in satin exterior. Autumn from Design Dump used this color on one of her exterior doors, (which was completely amazing, check it out!) and I love it! If you are looking for a dark, muddy gray, this is your color. 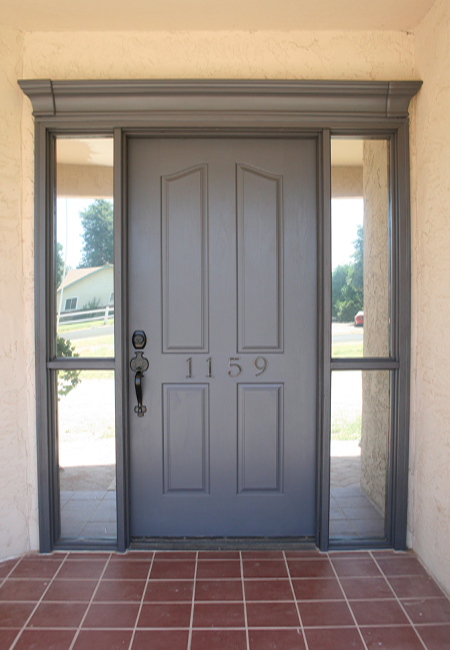 I also used Rustoleum's Metallic Oil Rubbed Bronze spray paint for the door handle. Here is the first "after" shot. A big improvement, but it was a little somber, and lacking something. So, I headed back over to Lowe's, and picked up some 4" numbers in the mailbox and address sign section. They were $3.98 a piece. Much better! You probably want to knock on my new and improved door and bring me some cookies, don't you? Don't be shy! Let me know if you'd like a tutorial on the hounds tooth M. I'd be happy to share. For hanging the M, can you put a picture hanger on the back- those sawtoothed things for example- and then hang it via an over the door wreath hanger thnigamabob? That looks so great! You are amazing. I had so much fun visiting with you guys on Saturday. My cheeks hurt from laughing so hard. This is beautiful! WOW! I adore the color on the door, the molding is just perfect! What a change! did you use a stencil for the hounds tooth? TOO CUTE!!! Thanks again for the chance to win the runner and DVD! I am so excited!!! Yes Please! Tutorial for the houndstooth M would be fab! Hey where are the pictures of you painting in the bikini??? That's what I want to see! Door looks really sharp by the way! I would love a tutorial on the houndstooth painting technique. I'd like even better for you to have a giveaway and I won the M. It's my last initial too! That cute tool-belt brother can come work for me any time! Love the new door. The door looks great! 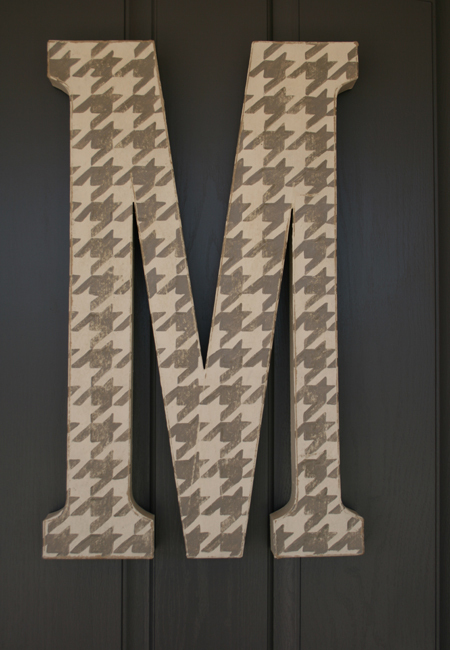 But, I LOVE that "M." Houndstooth was a good choice! PLEASE DO SHARE THE TUTORIAL ON THE HOUNDSTOOTH!!! OMG! To Die for. LOVEING THIS!!! Saw this on pinterest and ran over as soon as I could- I love all of it and feel very inspired! The crown molding is amazing!! Is it just an illusion, or did you do something with the sidelights? They look much more reflective and private. I'm looking for a good-looking solution for my sidelights, so I'd love to hear! You are so observant. Actually, we did have our windows tinted before I began the makeover. We get SO much heat and sun during the summer months at the front of our house. The tint makes it so you absolutely can't see inside during the day from the outside of the house. At night, you can only see in if the lights in that room are on. It blocks a lot of sun and looks mirror-like from the outside, but it does make it much darker in the house, which I'm actually not a big fan of. Hope that helps! Tutorial for the houndstooth M would be great! Have you already posted it? This looks fantastic! I'm moving into a rental, soon, so you have given me hope. And the houndstooth totally makes the whole thing. Oh love your transformation & just realized how old this post is lol still love it! Guess you could've used those command velcro strips maybe? 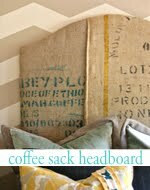 First off, I found your blog via the remodelholic site and I absolutely love it! 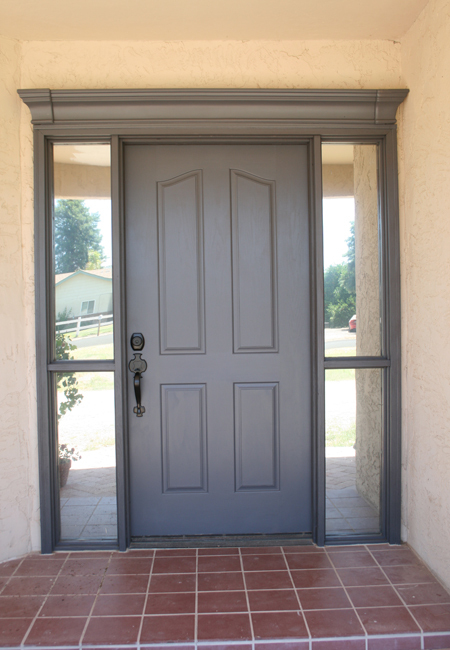 The door project is very useful since I am in the process of replacing my restored 80 year old antique front door with a more modern, but somewhat plain, prehung solid slab. I realize this post is a little old so this request may be too much to ask but I would love if I could find out how you did the houndstooth patten. I've been a huge fan of houndstooth for a while, as well as several friends of mine, so knowing how you did this difficult repeating patten would be widely used and appreciated! Was it a printed out pattern that was traced on and then painted? Did you used acrylics over a spray painted back ground? What material was used as the letter? I would be very thankful for any tips you could give me!! I did a post on the houndstooth monogram and here is the link. I think I got the letter at Joanns, but I have seen them at various craft stores. Please let me know if you have any questions about the tutorial! Beautiful. Love the 'after' so much more than the before photo. You did a great job. Thanks for sharing! If your door is steel, you can glue magnets on the back of the letter. New front door looks great. The professional painters & decorators know how to deal with the every thing related to house painting, therefore, hiring the best one is the most important and considerable point. I put loops of some kind on the back of my door decorations and then hang them on my metal front door with magnetic hooks. I use the larger/stronger hooks that are rated for 20 pounds because they can stand up to wind and slamming of the door. They will work with any type of decoration even if they aren't flat on the back. Wonderful transformation and just love the color! We just did the exact same thing on our front door - but I like the way you handled the ends-it looks very finished- are those separate pieces of moulding or cornices? we were going to caulk and paint- ugh! Love the numbers placed where they are. Adorable Letter - very original! 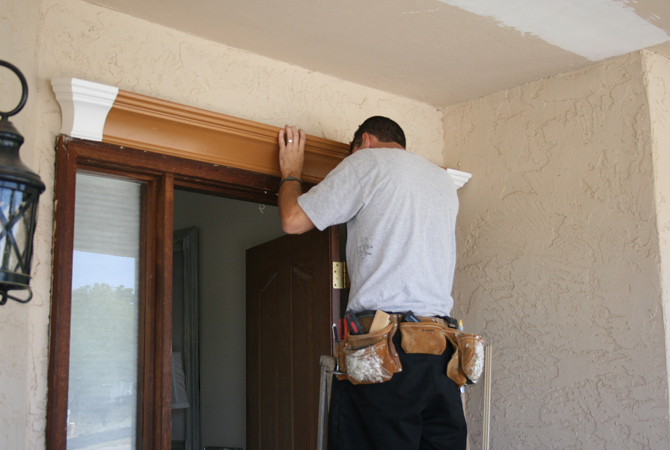 How did you attach the moulding to your door frame/front of the house? Also, was that piece of moulding all one piece or did you have to add those two end pieces? Wow! You've done a great job in redesigning your door. I'm pretty sure Jeff got an incentive from you after a job well done. Hehe! Kidding aside, this is another proof that repainting is one simplest ways to improve the curb appeal of your house. By the way, I love your accessories too! You gave life to your front door! Your chosen color, Iron Mountain, looks plainly serious, or somber, like what you said. Good thing you have thought of accessorizing it, and that somehow lightened its appeal. Jeff did a great job. Did you reward him for that? Wow and wow again I love it great idea totally new look. And yes I would love the tutorial. Hi Jilly, love this project and love the mirror tint on the side windows my question is did you do that yourself and if so how??? Or did you have someone come out and do it?? 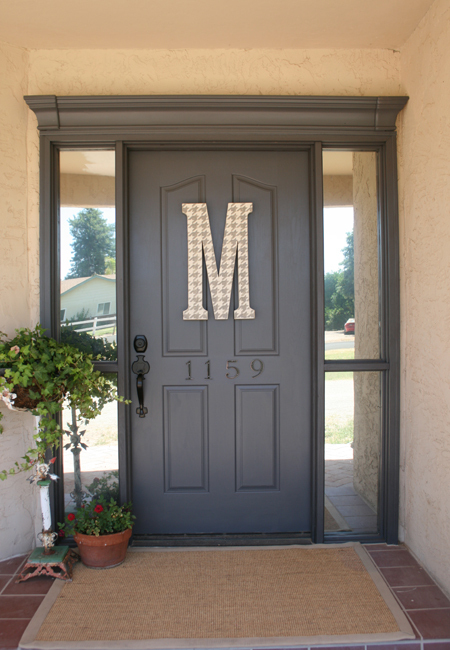 Before actually getting your door painted you need to decide the final color for your door. Also, keep a look at your surroundings before finalizing a color for your door. 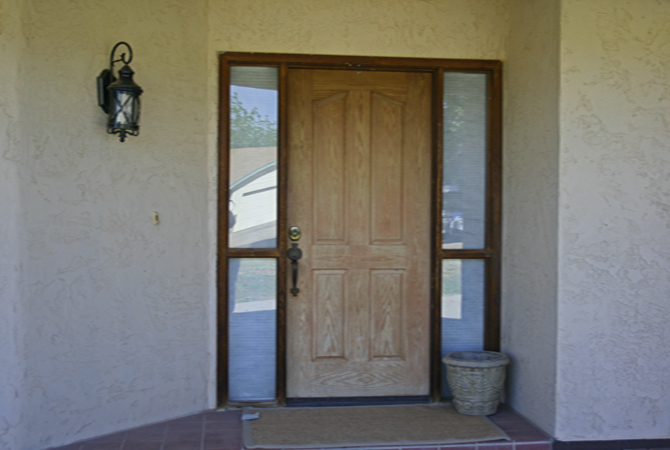 You can also paint your security doors with any bright color that suits the surroundings. I like the design of this door. It's fantastic. Thanks for sharing these information. It seems really interesting and helpful. Ujjawal National Packers and Movers offers moving and all moving related services like warehousing and storage services, Household Shifting, Office Shifting etc.